Graeme Webb is a model maker, bookbinder, and Polaroid photographer who lives and works in London, England. He trained as a darkroom technician during the late 1960’s, graduating to architectural and commercial photography with a smattering of 16mm film work and editing. After leaving the industry in 1983, he trained as an IT project manager and returned to the world of media in 2002, where he worked as a media consultant. Since 2006, he has been creating meticulously detailed, staged photography that plays with elements of scale, texture and lighting and the never ending cycle of nature modifying man’s achievements. The constructions, which are built from scratch, are either 1:12 or 1:6 scale (and sometimes down to 1:87 scale) are often collage. They also subvert the usual distinctions between interiors and exteriors, bringing the outside in and the inside out. Webb's miniature surreal worlds are then photographed and lit using torches and LED’s, atmospheres are created using water misting, projection and smoking techniques over extended exposures. No photoshop collaging or digital special effects are used in the process of producing the final photographic images. Small sets have been used in animations, short films and music album covers, more recently he has created 1:12 scale dioramas cased in ornate cabinets for corporate clients. Webb has exhibited at London's Barbican, Cottons Center, Holborn Studios, Linear House, the Strand Gallery and the Gallerie Huit Open Salon in France in 2011, Arcimboldi Studios. He has run workshops at Saint Mary-le-Strand Church in Piccadilly, 4D Model Shop, and a special event workshop at the Apple store in Covent Garden in 2013. During 2016 he brushed of his Polaroid equipment. which had been stored in the loft for a number of years, and tried incorporating it into his diorama photographic work flow. This has led to experimenting with Instant integral and pack film cameras and roll film. Graeme Webb also runs Arcimboldi press, which publishes limited-edition books and 'zines specializing in Polaroid and analogue photography. PRYME Editions recently had the pleasure of speaking with Graeme Webb about his new self-published zine, Last Vestiges - The Exhumed Project, and his experimental Polaroid manipulation technique. It was by complete accident that Graeme Webb came across this photographic technique in 2016. Webb threw a disappointing Impossible Project exposure into the dustbin in his garden. What he didn't realize was that his aim was so poor that it had slipped down the side and into the little area that traps dust fallen leaves and other bits of garden debris. Six months later he was clearing the garden and he came across this forgotten instant print, covered in dirt with several species of invertebrates scuttling around on it. The image was fading (but not completely) and the colors on the emulsion layer were subtly changing. The layer had a fine reticulation: odd blisters, mold, scars, and the plastic frame was falling away. Webb carefully cleaned the frame and when it was dry, scanned it. At a very high resolution scan, sections of the image showed fantastical new worlds of crumpled silk, Turneresque skies, and metallic landscapes. Here and there parts parts of the original image still survived and looked out at him like a ghostly figure from some arcane and forgotten world. It was in this moment that he decided to pursue a project that would utilize this serendipitous technique and start experimenting with different dyes, inks, and additives to try and influence the outcome. Some of his experiments worked, most didn't. Webb discovered that high temperatures quickened the process but gave a totally different feeling to the slow, freezing conditions. All in all his technique gave control over to nature to do with his images what she pleased. Connect with Graeme Webb on Instagram and Etsy! Graeme, can you tell us about your history with photography in general and specifically your history with instant photography? When did you start shooting? What drew you to use instant photography as a medium? After I left school, I trained as a darkroom technician in a photographic studio. This was around 1973. As well as Kodak and Cibachrome colour printing, I specialized in large format interior photography for the likes of Biba, Cecil Gee, and Selfridges. One day my boss returned from a trip to the US with this weird looking camera called a Polaroid SX-70. He raved on about how Polaroid and its instant film was going to put us out of business, but it didn't stop us being wowed by the magic of this technology and spending a couple of hours on the pavement photographing passing cars in Golders Green. If I remember rightly we burned through seven packs of film. We eventually acquired several Polaroid cameras, also backs for 5x4 cameras so we could use pack film. These were ideal for showing clients ideas we had for shoots. Eventually I left the industry around 1979 and lost touch with photography as I pursued a career in IT project management. Aside from your recently acquired instant film obsession, you have spent years creating and photographing miniature surreal worlds using hand made models and scenes that any other individual would have to create digitally. How does your background in miniature set design cross over into your photography? After a few years in IT, I was looking for a new direction and moved to a job in media, film and video production. A few years later I was made redundant and took up the challenge of trying to do it on my own. During this time I trained people in post-production and produced corporate videos. I also got exposure to stop motion animation through working for small independent film units, and this is where the interest in the small scale sets started. I started to return to photography using the sets as subjects. The Bleak House series started quite by accident and would fill another interview on its own, but it lead to several exhibitions of work and commissions for cabinets containing little worlds. The work in Last Vestiges is centered around the reincarnation of failed Impossible Project images. In 2016, you pioneered the technique to turn "wasted" Polaroids into unique works of art and inspired multiple photographers to adopt your technique of accidental genius. Can you tell us how you came to understand this technique? I don't think I can take all the credit, there are lots of artists out there manipulating instant film stock and 'failureroids' with a lot of success, and all have their personal techniques with quite unique results. My experiments started after I threw a TIP print in the dustbin and it missed, falling behind a fence. I found this about 6 months later and was intrigued by its appearance. You have been working with this technique now for over a year. 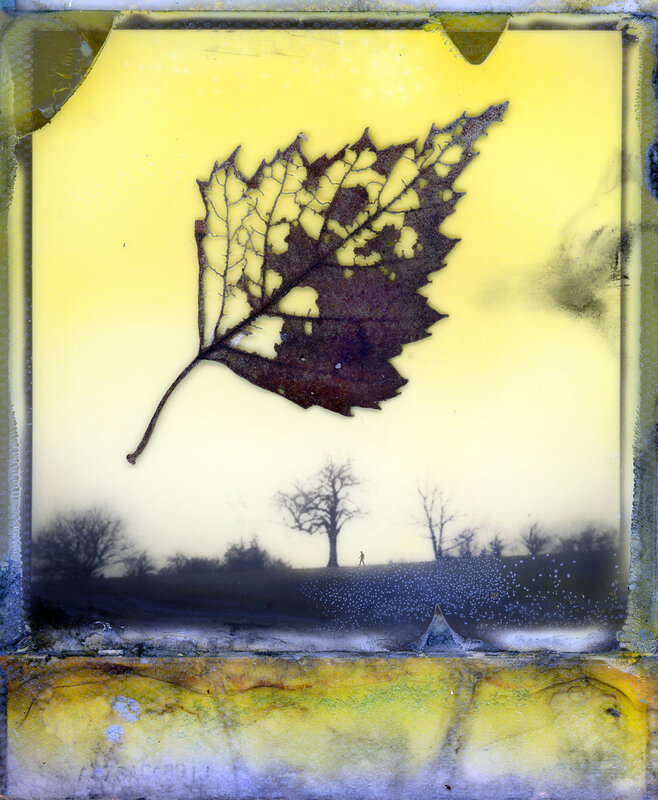 Can you share with us how you have come to master and control the way your Polaroids age and transform? Do you have a favorite way of manipulation? What produces the "best" outcomes? I started trying to influence the results by injecting the prints with acrylic inks, dyes, burying them with corroded metal and copper sheet in trays covered in peat and leaving them out in the rain and frost. After a while the adhesive that holds the frame together comes apart and insects start getting in along with soil bacteria which subtly start affecting the emulsion. I have found soaking in milk and burying, although unpleasantly smelly, gives quite an interesting result. It's all hit and miss and some work but most don't. The ones that work better are the images that still retain remnants of the original image. I feel that the print or film stock I have exposed is the start of the creative process for me. I spent many years in a technical straight jacket leaving nothing to chance, and this serendipitous approach to image making is very therapeutic. The title of your publication, Last Vestiges, literally means the last a mark, trace, or visible evidence of something that is no longer present or in existence. How did you come to call your latest book this and what does it mean to you? I'm fascinated by ruins and the patina on ancient objects which can be witnessed in my diorama work. I spent my childhood playing in the post war destruction of south London, where trees and mini meadows grew in the interiors of the bombed out homes of Greenwich and Deptford. I feel these little prints are the sort of thing I might have found buried in the cellars of these buildings a trace of something that may have once lived in the sun. How did you go about creating and compiling your images for this specific project? Were they a curated set of images you have previously produced or were they created especially for this book? How did you choose what images to include and how to sequence them in book format? These images were specially created; the subject matter and compositions needed to work with the chemical reactions, so compositions and colors had to be strong. Most are original camera images which have been scanned and then printed via the impossible Lab. You have been a bookmaker and bookbinder for 8 years and you have self-published two books through Arcimboldi Press based in London. How did your past experience help you accomplish and prepare for Last Vestiges? Most of my bookbinding skills had been used on renovations up to this point, and 'zine production was something new to me. I had made books with Blurb but wasn't very happy with the output and always felt that the handmade book was the way to go. I invested in an OKI laser jet printer, and the first one I produced was the 'Instant Possibilities' experiments with with instant film. This was a good learning opportunity on how to design and put one together. I think making this an edition of 100 was a bit optimistic, although I think I'm up to the mid-fifties in sales now. I try to keep it simple with materials and binding as the process can be quite time consuming. So now I have a pattern for producing straight forward books and 'zines simply. Not only does Last Vestiges include your revived failed Polaroids, but it also offers us close and intimate views of the fine details, textures, and color transformations that your images went through. What inspired you to present your images as a whole, as well as in pieces, showing the specific details of each image? 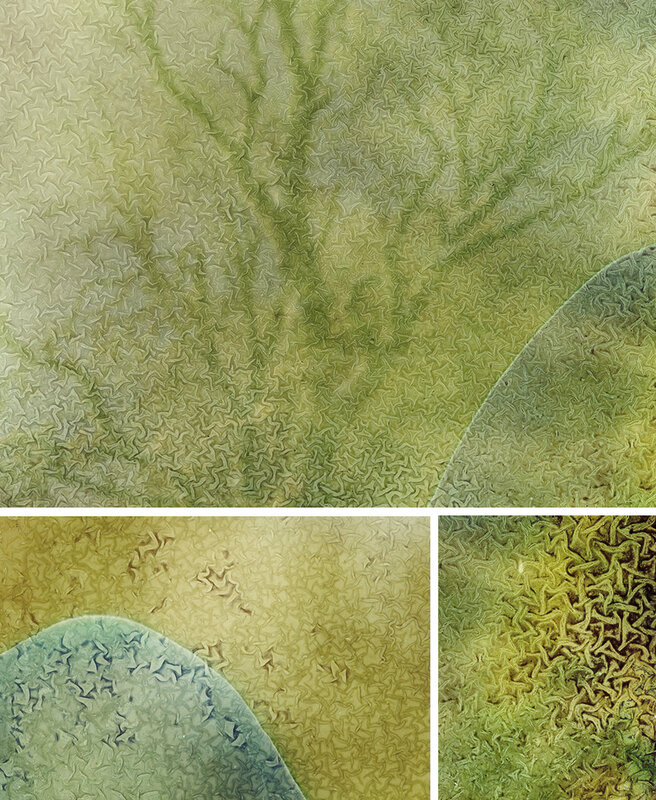 I wanted the viewer to see the intricate textures and patterns created by nature on the emulsion I scan at 2400dpi, so one can drill down on the detail and view some of these strange worlds. If you had to chose your favorite image from this publication which would it be and why? I think it would be the monochromatic 'Tree Line' image center pages 16-17, it feels very ancient to me, and the emulsion scars and aberrations look like swarming birds. I would definitely classify your work as on the "cutting edge" of photographic expresionism, ironicly using instant film. How do you see the evolution of your type of work becoming a larger part of the photographic community? The instant film community is very kind to my work and others who are not so knowledgeable seem to appreciate the images when the technicalities have been explained to them. The work crosses over quite well, and I have been asked to supply very large images to people who thought they were abstract prints. I think like most things in life you can only go so far, so we shall have to see. You are releasing Last Vestiges on your etsy shop in a limited edition of 20, and a limited edition of five for us here at PRYME Editions. How did you choose which print to include with each edition and can you tell us how each edition differs? The Books are basically the same except for different covers. The main difference is the edition of 20 has two prints, a diptych of The two Brighton Piers printed on Permajet Platinum Lustre paper these two images have proven to be quite popular. The Permajet paper is similar to Kodak 'Endura' which has a metallic finish to it. I think the instant prints especially, when the white border has been removed, really pop off the paper. The PRYME Editions version of five has a larger print, one from the book, in fact the first one I ever discovered, the leaf was stuck to the front of the print, so I kept it for the scan collaring it. As well as having my own hand made marbled paper bound into the book, the box is lined with another sheet. The print in this edition comes with a certificate of authenticity. Do you plan on showing these images anywhere in an exhibition setting? Do you have anything else planned with the Last Vestiges? I plan on getting some large images printed on the metallic and cotton rag paper as I have had some interest from collectors. My experiences of exhibitions over the years haven't been positive, so I don't have any thoughts in that direction, other than to continue with the books. Coming up is 'The London Sessions' with Trevor Crone, and I have a project planed with 3D stereo-graphic photography around London's Borough market. Finally in the pipeline is another collaboration which, although it features instant film, will essentially be a multimedia project.